Chiropractic: it is a science, art and philosophy that restores your body to its natural state of being a self-regulating, self-healing organism. With different techniques and styles to suit you, Dr. Bhullar first evaluates your needs with a thorough consultation and examination process. The focus of chiropractic care is removing subluxations that interfere with your nervous system, which is the master control system of the body. When no interference is present, you will not experience disease and symptoms such as pain. Most people are unaware that they have subluxations because they don’t have discomfort. They can be present, however, and cause the deterioration of your health without any signs that it is happening. How you feel does not necessarily indicate how healthy you are. We understand that for many, this may be their first time being adjusted. We pride ourselves in having a relaxing atmosphere and the gentleness of our care. Dr. Bhullar will walk you through the process of an adjustment before starting; she has experience with patients as young as a few days old and patients into their 90s. The specific technique or therapy used is based on each individual patient, their age, health and preference. A chiropractor is an expert in identifying and treating subluxations. 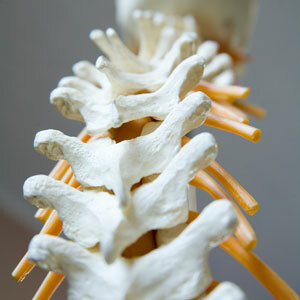 A spinal joint is made of two verte-bral bones with a disc in the middle and spinal nerves that exit at each level. A subluxation is when a vertebrae (spinal bone) shifts from its proper position and causes pressure on or irritates a spinal nerve. This pressure causes the interference of signals traveling over those nerves and affects the nervous systems ability to coordinate or control the functions of your body. Subluxations can result from car accidents, slips and falls, poor posture, normal daily activities, illnesses and traumatic injuries. When this bone is out of place and not in its proper alignment, it causes pressure on the nerves, which can adversely influence everything from the soft tissue (muscles, tendons, ligaments and blood vessels) to the central nervous system. This pressure results in pain, stress, de-creased immunity, loss of vitality and optimal nervous system function. During the adjustment the chiropractor will use her hands or instrument to bring the bone back into alignment and remove the interference/pressure. This is done very quickly and often there is no discomfort. If you hear a noise or ‘cracking’ sound, that is the pressure being released, similar to when we open a can of pop. The pressure being released in your joints does not cause pain and will often make you feel better immediately. The many techniques we utilize include hands-on and instrument-assisted methods such as Thompson Drop Table, Diversified and Activator Methods. Our goal is to provide each patient with the technique that will result in the best outcome and be the most comfortable. We pride ourselves on taking our patients health goals seriously, no matter the condition or age, attention to detail and building person-al relationships. This is why so many of our patients love to refer their friends and family members to our office. Activator Methods: Low force adjusting technique done with an Activator Methods Adjusting Instrument (which is a handheld spring-loaded tool that delivers a consistent low-force high-speed thrust. This tool delivers a much faster adjustment, making it more comfortable since the body doesn’t tight-en up. It is also helpful for adjusting other joints of the body such as wrists, elbows and knees. Diversified: Once we have identified the subluxations in the spine, through examination of the spine and x-rays, we are able to determine the direction, angle, depth and speed for the manual adjustment to correct the misalignment. During this correction a ‘popping’ sound results from the gas and fluids that move about within the joint. The sound is not used as a guide to determine the effectiveness of the adjustment but it does sound cool!! This helps us to improve the spinal biomechanics and reduce nervous system interference and help restore proper range of motion. Virtually all joints in the body can be adjusted. Acupuncture: is a great compliment to chiropractic care for pain relief. It is a procedure in which thin single-use (disposable) needles are inserted in to the body to treat the area of concern, with or with-out electrical stimulation. If you would like to schedule an appointment, contact our Brampton office today!